In an Australian first, countless numbers of native fish will be saved thanks to a Victorian-designed and made irrigation diversion channel fish screen. The screen, which is located between Gunbower Creek and the Cohuna Irrigation Channel, was funded by the Victorian Environmental Water Holder and is a key action in the North Central Catchment Management Authority's Native Fish Recovery Plan for the Gunbower and lower Loddon system. The Cohuna Irrigation Screen is a win-win for native fish and irrigators. Native fish are kept in Gunbower Creek without compromising the delivery of water for irrigators. 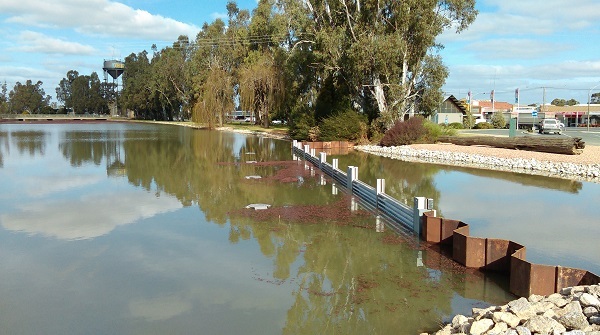 Investments in fish habitat restoration, flows and fishways are enhanced and more Murray cod and golden perch in the creek means better fishing opportunities for recreational fishers. So why do we need fish screens? Each year, up to hundreds of thousands of native fish and larvae are lost from the Gunbower Creek and the Murray River system as fish move into irrigation channels. Once in irrigation channels, the fish are lost to the natural system forever, having a negative impact on breeding and population numbers of native fish. Since early European occupation, native fish populations have decreased by 90 percent across the Murray-Darling Basin. In the Gunbower and lower Loddon, only 13 of 22 native fish species are still present in the system today. And of these, six are listed as threatened. Migratory Australian fish species, such as yellowbelly and silver perch are particularly vulnerable to getting lost in irrigation channels. Whilst in the egg larvae stage many species drift and are therefore just as vulnerable. This is one of the key factors behind the decline of native fish populations within the Gunbower Creek. During a tagging project in Gunbower Creek 20 per cent of tagged young-of-year and adult golden perch were found to enter an irrigation channel but none were recorded returning to the creek. Surveys of the Cohuna Channel (before the construction of the fish screens) found that it traps up to 5,500 native fish larvae, including more than 160 Murray cod larvae, per day. How do the screens work? The screen essentially acts like a giant tea strainer – allowing water to pass into the channel so it can be used by irrigators but preventing fish larvae and eggs from passing through. It also incorporates some important design features. Firstly, internal diffusers ensure that the approach velocity of the water (and anything suspended in it) is less than 0.1 metres / second. This means that larger fish can easily swim away and plants drifting in the water can be swept away from the screen by currents in the water. The second important feature are a series of motorised brushes that clean the screen face once per day. This ensures that the surface of the screen does not get blocked and that water can continue to pass through the screen and be delivered to irrigators downstream without disruption. If you would like to find out more about the Native Fish Recovery Plan go to the North Central CMA website.